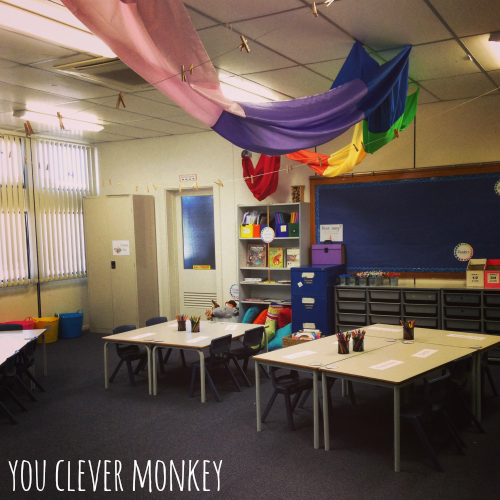 This term I'm very excited to have the opportunity to set up my own classroom for the first time. 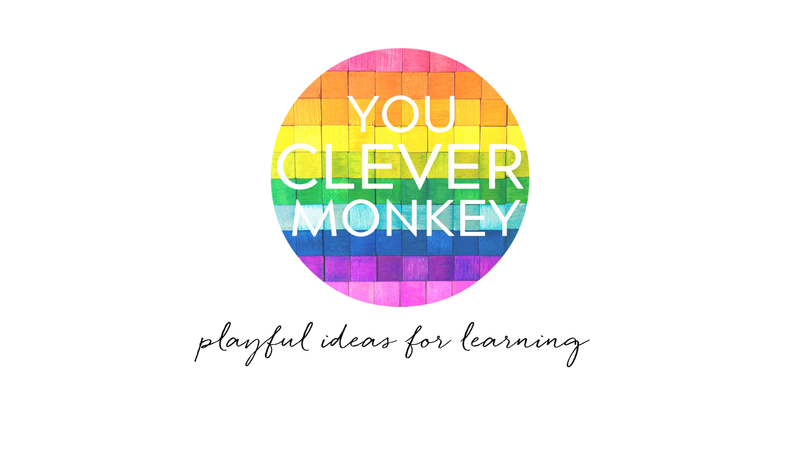 Usually I've borrowed someone else's classroom when I've filled in for them but this time I was greeted with pretty much a blank slate so I thought I'd give you a peek at how I've set things up to start the year. Having my own classroom meant I finally get to try all the things I've ever liked about other classrooms I've been in and, of course, seen on Pinterest. 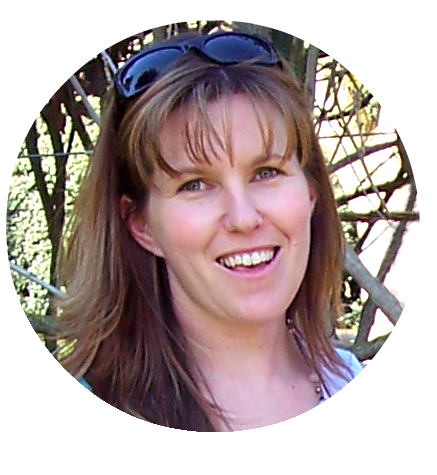 Frequent visitors here will already know that I tend to make a lot of the things I use in the classroom and at home. It started as a result of frustration, of not being able to find exactly what I want available online but now it's just become routine to make what I want. I'm also a fairly organised person so my new classroom is a reflection of both of these things. 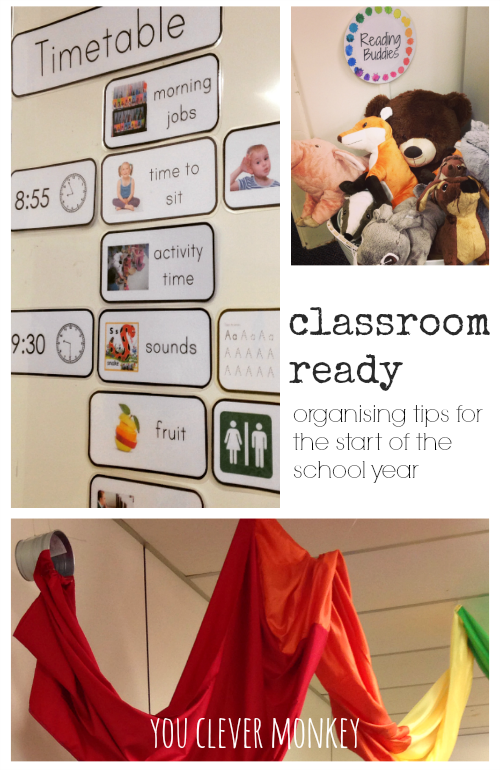 My main focus in the week leading up to the start of school was getting the classroom processes set up so it would be easy for me to manage all the work that comes with being a full time classroom teacher and allow new children and their families to quickly become familiar with the routines of school. With that in mind, everything is labelled. Each child has their own tray for their hats, pencil cases and other bits and pieces. I had each child decorate their own tray names on the first day. All of their books are sorted into separate trays for each subject area which allows me to grab just one tray out for the lesson rather than have the whole class try to negotiate getting the right book out of their own trays each time. A definite time saver! Each child has their own named tub of playdough which is also kept in one of the trays at the back of our classroom, another tray above has different playdough mats they might like to use which I will keep changing over during the term. We used our playdough for the first time on Thursday and since then they have been out every spare minute since. We used them in maths initially then during activity time, before school and then during literacy centres to try and make our names on Friday. 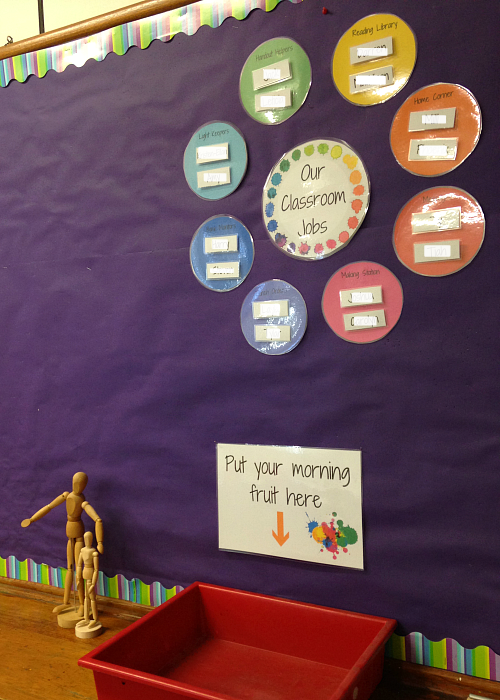 I've created a spot for students to place their morning fruit, reading folders and message books and have been encouraging children to complete these jobs when they first enter the classroom before going to play. 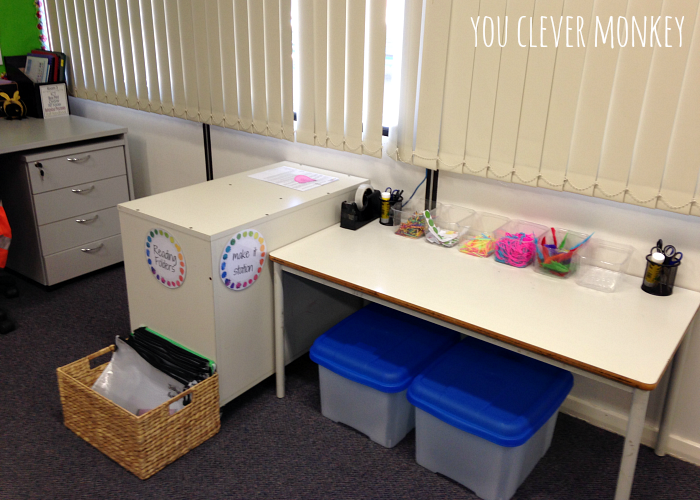 We also have some simple classroom jobs for student to do. These will change weekly to allow everyone a turn at something different. The pairs of names will just rotate around the centre. 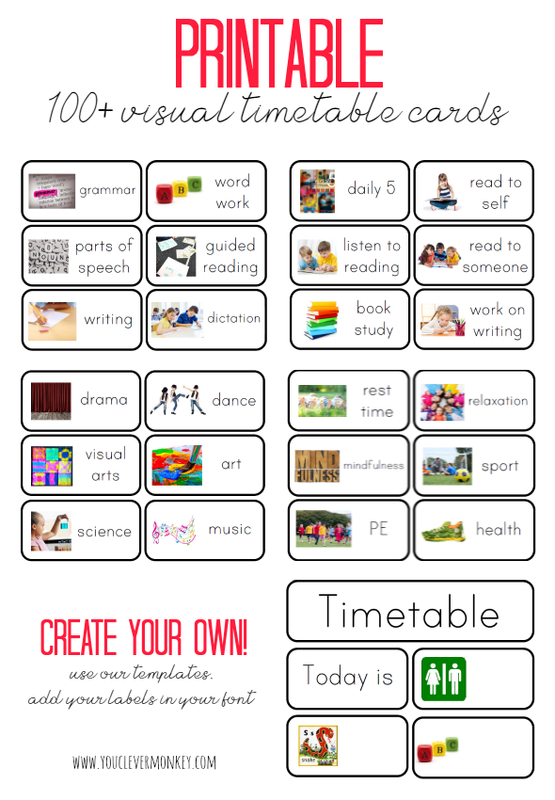 I also made this visual timetable which I move around daily to suit out activities but with no pesky arrow that I need to keep moving. 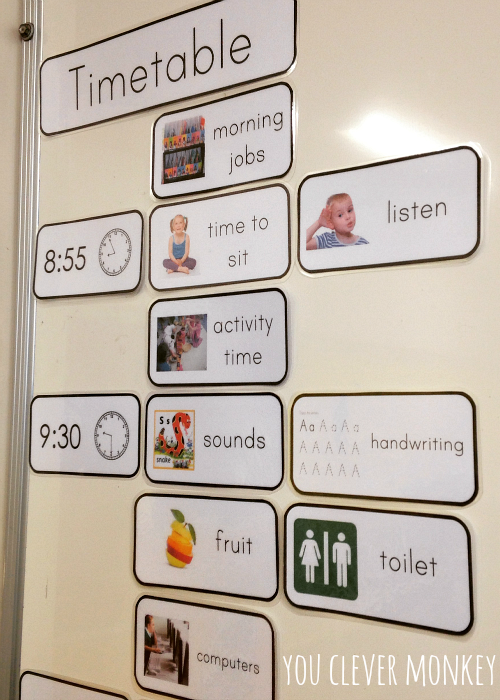 The cards are laminated and just blu-tacked onto the whiteboard to allow for easy movement. I also made this behaviour chart which is in line with the school's behaviour policy ready for our first days at school together. It also stretches to bronze (for making great choices! ), silver (for excellent choices!!) and gold (for AWESOME choices!!!) from the green starting dot so children can see they can move up as well as down. My own three children decided I definitely needed a prize box in my classroom so they had great fun filling it during the holidays. I'm still undecided about the value of intrinsic rewards in the classroom but we'll give it a trial. I've also got some 5L (legs crossed, hands in laps, lips locked, eyes looking, ears listening) mini posters at child eye level under our whiteboard at the front of the classroom. 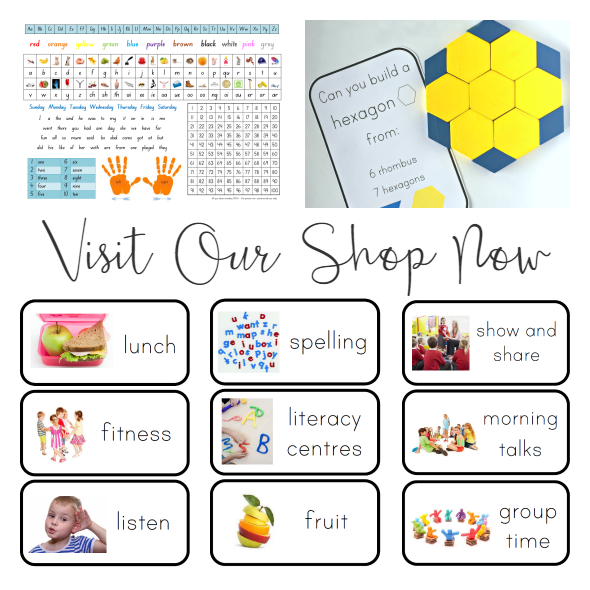 I have a combined Reception (first year at school)/Year 1 class this term so I wanted to create a warm, welcoming feel to the classroom to help every child feel comfortable especially those transitioning to school from preschool. 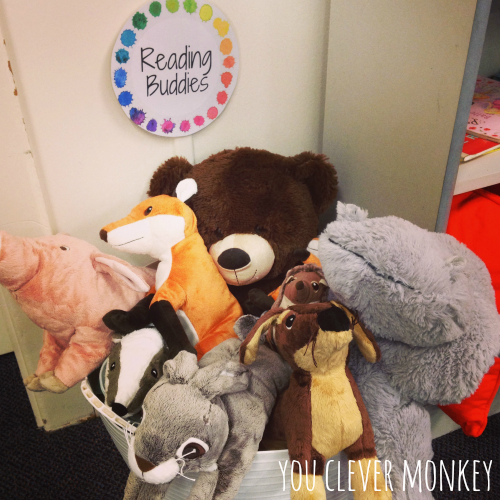 I've started with some friendly reading buddies next to our classroom library along with some pillows for rest time. With no art room right next door, I've created a mini making station for use during activity time for now and in the next week or two, I'll be adding a home corner for some pretend play as well as I believe these spaces are still so important in the first years at school. Communication with families is of great importance so along with several notes home in this first week, some face to face time with most parents, I'd also set up this simple timeline along the bottom of one wall ready to put a week's work of photos up at a time during the term for both children and their families to view. As you can see I haven't put much up on the walls at all for the start of the term focusing mainly on classroom organisation and behaviour but I have planned several activities for the children in the coming few weeks so they can start to make the classroom their own. In the meanwhile I thought a splash of colour would help brighten things up and I haven't met too many 4-5 year olds who don't like rainbows. To create the rainbow, I just purchased seven metre long lengths of lightweight silky fabric from Spotlight, sewed the ends together to form one long strip then hung it from the ceiling, spilling out of this pretend paint tin. 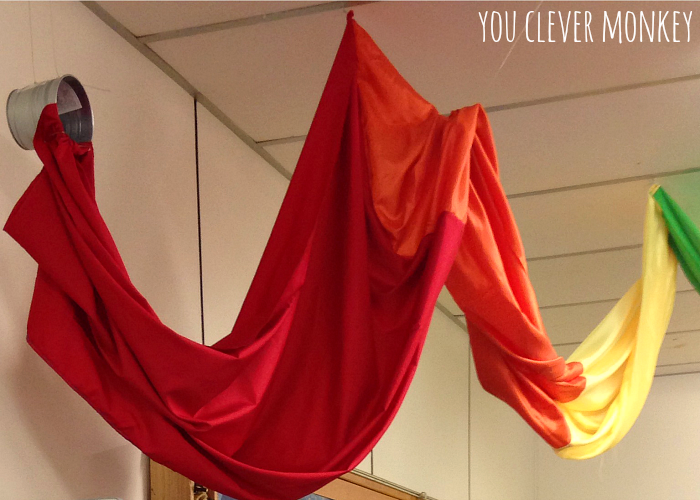 We also going to be focusing on mixing colours with different mediums this term so I thought it a relevant start. It's hard to take a decent photo but it turned out okay. 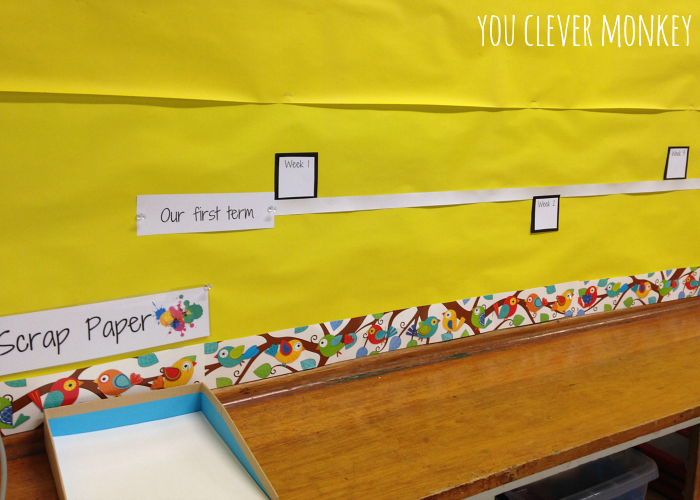 I hope you've enjoyed the look around my new classroom. 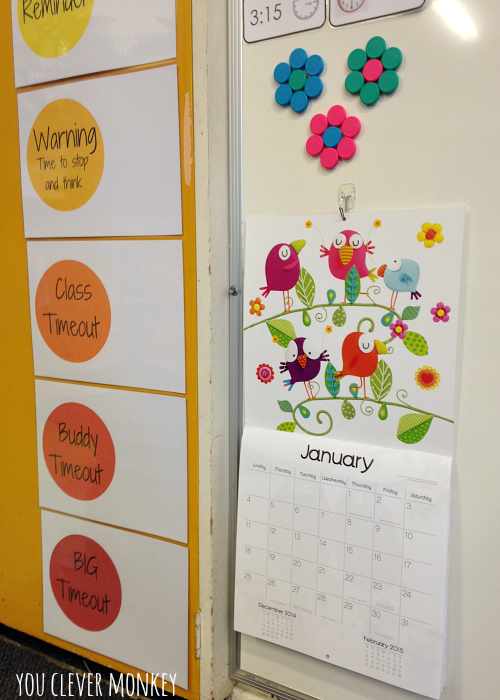 You might also like to check out my Classroom board over on Pinterest too.